Originally written together as a single book in the Jewish Scriptures, Ezra and Nehemiah document the fulfillment of God's promise that Israel will return home after 70 years of exile in Babylon and restore their ruined dwellings again. Fulfilling Jeremiah's prophecy, Persian King Cyrus allows the exiled Jews to return home. Zerubbabel, Nehemiah, and later Ezra travel to Jerusalem. Rebuilding Israel begins. Despite local opposition, Zerubbabel and the Jews successfully rebuild the Altar and God's Temple. They officially celebrate the Passover the first time in 70 years. After hearing the Torah, the Jewish people realize the sins they committed and immediately address them. They repent, swearing an oath to follow God's laws. Zerubbabel and Nehemiah both play a part in restoring God's Temple, while Zerubbabel takes charge over governing affairs, and Nehemiah rebuilds the Walls of Jerusalem. 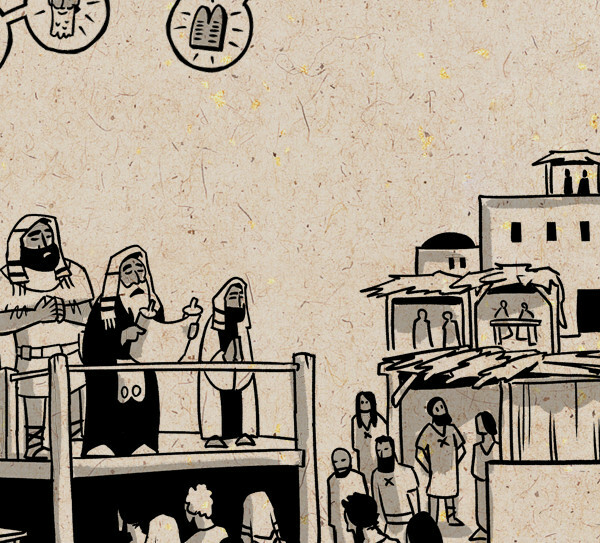 Ezra, a descendant of Aaron, arrives in Jerusalem later and instills God's laws to the post-Exile Jewish generation. Note how the people received revelation and responded after they listened to the Word of God that was being taught to them. This response is remarkably similar to Jesus' teachings about God's Kingdom centuries later, and His often-repeated phrase, "He who has an ear, let him hear..." The takeaway? Whether it's ancient Israel or our worship today, we all must receive a new heart from God and listen to Him. Though God's name is never mentioned, the Book of Esther is filled with examples of God at work behind the scenes for the benefit of His beloved children.